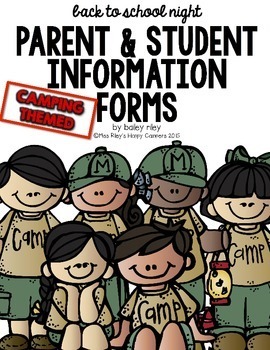 *2 Page — All about your Camper - Getting to know your child Questionnaire for parents to complete. 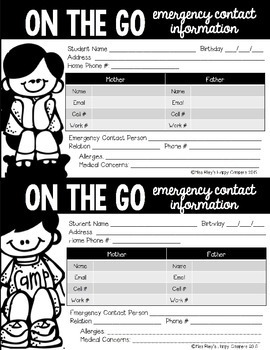 These information sheets are a helpful way to get all of the contact, transportation, and other general information that you need about your students and their families. This bundle of forms is printer friendly in all black & white. To make these more fun, copy them onto bright colored paper! I like to keep my "On the Go Emergency Contact Information" cards on a binder ring in our emergency folder, that way I have them at hand during any school drills. I also take them with me on school field trips! I hope this will help make things easier for you and that you can use these at the beginning of the school year for your school's Back to School Night, Meet the Teacher Night, Open House, and MORE! I have set up editable text boxes on pages 6, 9/10 and 11! 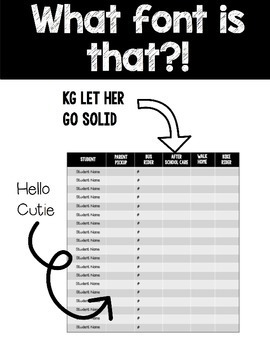 See page 2 for ideas on what to change! This resource is a PowerPoint document. Each editable page (listed above) allows you to enter your own text by clicking on an existing text box. Just click and type! All images are locked down and not able to be changed or moved. To see everything included download the preview.